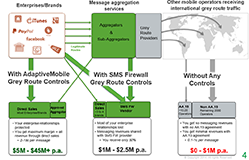 Grey Routes occur when commercial messages are sent over connections where the sending or receiving operator is not appropriately paid. For many operators the connection agreements between their networks and those of peering partner, which enable billing and settlement for message termination, are structured for P2P traffic. This can mean significant revenue leakage for operators who receive large volumes of A2P messages, often originating from major brands, but funnelled through unauthorised grey route P2P channels. AdaptiveMobile Messaging Revenue Protection can help operators tackle a broad range of challenges to their messaging business. Using in-network controls, subscriber reputation and advanced discovery and detection algorithms, the AdaptiveMobile Network Protection platform can identify and control this traffic – protecting an operator’s current and future messaging business.